On 20 May Feng-Chun Ma and Paul Ruitenbeek of Feng-Chun Ma Chinese and Japanese Art Consultancy cordially invite the members of the Asian Art Society for an exclusive visit to their selling exhibition ‘Imperial Porcelain and Scholar’s Objects’, which will be open from 15 until 25 May. Almost all objects included in this exhibition come from Dutch Private collections. Feng-Chun Ma and Paul Ruitenbeek will give an introduction to the collection. A catalogue will be present and can be purchased for €20,-. Under supervision, the objects may be viewed by hand. You are required to register for this visit directly with Feng-Chun Ma and Paul Ruitenbeek on info@fengchunma.com. There is a maximum of 20 participants. It is also possible to visit the exhibition on another day, yet again, please register beforehand. ‘Kraak’ porcelain, famille rose, and Imari are familiar terms to the Dutch collector of Chinese porcelain, however not all Dutch collectors realise that there is a difference in taste between the Chinese and the Western collector. In China, the emperor’s taste was leading in the production of porcelain and other works of art. 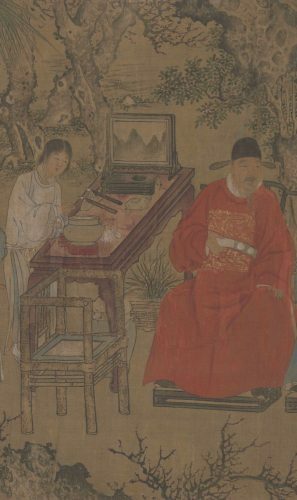 In the imperial workshops of the Ming and Qing dynasties continuous innovations took place whereas at the same time the styles of preceding dynasties were a source of inspiration. The class of the Literati comprised scholars that were often living a reclusive life and thus developed their own taste, expressed in so-called ‘Scholar’s Objects’. To them, nature was all-inspiring. Despite the fact that the taste of the emperors and the scholars differed in many aspects, there were resemblances as well. Both emperors and literati appreciated the art from the past such as archaic bronzes and objects from the Song dynasty. Also, both emperors and literati set high standards for craftsmanship and material. On top of that, often emperors were also scholars themselves and practiced writing, painting and collecting. We hope that in this selling exhibition we can give an overview of the differences and resemblances in the taste of the emperor and the scholar and that the Dutch collector will grow in their appreciation of these beautiful objects.